It’s easy freshman year to get in a rut and find yourself going to the same places. You get to the point where they all seem the same and blur together. Why not break the monotony and venture out? 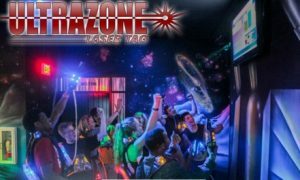 Getting off of campus is a little scary being a freshman but Ultrazone is a worthy reason to get out of dodge and play a lighthearted game of laser tag or for some a more intense and competitive game of laser tag. So you’re wondering, how do I get there? Well if you have a car it’s about a 18 minute drive from campus. If you’re not one of the lucky few with a car on campus, you can hitch a ride on the 14 bus, and then take bus 67. If you’re not feeling a long bus ride you can share an Uber with a couple of friends too. Ultrazone has your back and knows that students bank accounts can appreciate a student discount. On Thursdays there is Thursday Thunder and students get half off games with a valid student ID. If you’re bogged down with homework or have an early lecture on Friday don’t fret, there’s specials on Friday and Saturday too. From 8 pm to 12 pm you can play unlimited games for $25 per person, not shabby for 4 hours of game time. If anything I’ve learned about school is you have to have fun every once in a while and remember you’re still young and need to enjoy life. It’s easy to lose yourself in schoolwork so venturing off campus to do something fun at Ultrazone.